Miscellaneous Musings: The White Album 50 Project: "Everybody's Got Something to Hide Except Me and My Monkey"
The White Album 50 Project: "Everybody's Got Something to Hide Except Me and My Monkey"
One of the shorter songs on the Beatles' White Album, "Everybody's Got Something to Hide Except Me and My Monkey" takes the prize for having the longest title of any Beatles song - ten words. The lyrics describe transitional, even transcendental experiences by going deeper and flying higher, and being inverted in and out, out and in. Some people assumed that "Everybody's Got Something to Hide Except Me and My Monkey," written primarily by John Lennon, was about a drug high, particularly heroin. There have even been a couple of suggestions that John based "Everybody's Got Something to Hide Except Me and My Monkey" on a lecture from the Maharishi Mahesh Yogi about letting oneself go. But the source of the song's inspiration, is ironically, an unflattering caricature of that inspiration. 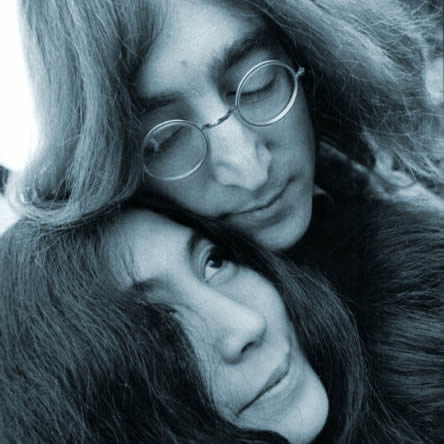 According to one source, John was shown a cartoon depicting himself with Yoko Ono represented as a monkey literally on John's back, digging her claws into him and draining him of his creative talent. He responded that at least he and Yoko had nothing to hide from anyone, living their lives in public as they were. He then made a jokey offhand remark about the cartoon - "Everybody's got something to hide except me and my monkey!" - and so came up with the idea for the song. John explained the carefree, nonchalant lyrics of "Everybody's Got Something to Hide Except Me and My Monkey" in 1980, when he said that the song was about him and Yoko. "Everybody seemed to be paranoid except for us two, who were in the glow of love," he said. "Everything is clear and open when you're in love. Everybody was sort of tense around us: you know, 'What is she doing here at the session? Why is she with him?' All this sort of madness is going on around us because we just happened to want to be together all the time." Indeed, Yoko had become a distraction at the recording sessions for the White Album. John brought her to the studio, introduced her to the other Beatles, and he made it clear that she was his guest and that she was free to stick around, because the two of them wanted to be together. The other Beatles grew to resent this, especially when Yoko made innocent suggestions to them regarding their playing. But they tolerated her as best they could, knowing that she made John happy and deciding it was a small price to pay . . . until the price increased as Yoko became more intrusive. But not necessarily because of anything she did, but because she just . . . was. Not everyone at Abbey Road agreed that Yoko was a nuisance. "The nice thing about working with John and Yoko," EMI engineer Jeff Jarratt said about a separate recording session he did with them for one of their experimental albums, "was seeing just how much in love they were. They had a fantastic relationship, even though they took a lot of 'stick' for it." The music of "Everybody's Got Something to Hide Except Me and My Monkey" is as freewheeling as the words are. John starts off the band with a strident chord but then leads the Beatles in a rollicking, energetic guitar groove, and each of the three verses ends with a brief but pointed guitar solo, a heavy cowbell making the song all the more infectious throughout. The song drifts into a loose, percussive interlude with the Beatles getting carried away with repeatedly singing "Come on, come on " - no doubt enjoying the memories of recording "Please Please Me" - before Paul McCartney's bass takes command to lead the music into a great guitar groove to set up the fade-out, which Tim Riley, in his book "Tell Me Why," describes better than I could. "The repeated groove they brand into the end of the song," he wrote, "goes around six times, instead of the usual four or eight, and it makes the return of the original verse texture startlingly swift and powerful. The six-time groove dams up the energy of the entire song; and when it bursts open, the band comes through with irrepressible force, cowbell clanging like gangbusters." "Everybody's Got Something to Hide Except Me and My Monkey" captures the Beatles having pure, unadulterated fun with their music. It; all the more ironic that the wellspring of this fun - the song's muse - was giving three of the Beatles so much consternation. In fact,I don't see how anyone can see how this nerve jangley,rolicking song could be describing such a downer drug as heroin.